Will Rita Jeptoo's Failed Drug Test Unravel Kenyan Running? The news du annum in running is that one of the top distance runners in the world, Kenyan Rita Jeptoo, tested positive for the performance enhancing drug EPO in an out-of-competition evaluation. Jeptoo won the Oct. 12 Chicago Marathon, and was due to travel to New York on Oct. 31 to accept the $500,000 prize for winning the 2013-2014 World Marathon Majors series, but the presentation was suspended and she remains in Kenya. It's important because Jeptoo is by far the most successful Kenyan athlete to fail a drug test, begging the question—why would she take such a huge and unnecessary risk? And, because of her status in the running community, it's assumed the shock will precipitate an investigation into long-held rumors of doping and, eventually, more transparency in Kenyan athletics. The story is still developing, but here's what's known so far. On Oct. 31, RunBlogRun blogger Larry Eder broke the news that Rita Jeptoo tested positive for a banned substance in an A urine sample, taken out of competition in Kenya. The substance was later revealed to be the glycoprotein hormone EPO, which stimulates red blood cell production. More red blood cells carry more oxygen to muscles, thereby enhancing aerobic, endurance performance. The test was conducted in September by the International Association of Athletics Federations (IAAF), with financial support from the World Marathon Majors and the World Anti-Doping Agency (WADA). Though Jeptoo has not issued a statement of any kind, her agent, Italian Frederico Rosa, and her coach, Claudio Berardelli, deny any knowledge of her drug use, adding that they were not informed of her positive test until after she ran (and won for the second time) the Chicago Marathon. Athletics Kenya, the national governing body, has been accused of lax and inconsistent support of drug testing. They sometimes blame lack of money and resources, and sometimes the influence of European agents, coaches and doctors for the problem. Then again, Athletics Kenya has, in the past, insisted there is no problem, that testing continues apace. As of this incident, that talking point is no longer proffered. On Nov. 4, Jeptoo met with Athletics Kenya members in Nairobi and requested that her B sample be tested. She could have passed on the B sample, and simply accepted a two-year ban. As is, she is provisionally banned, and has received neither the $100,000 prize from the Chicago Marathon nor the $500,000 from WMM. Frederico Rosa, who is a nonpracticing doctor, told Competitor that mistakes are rare in the urine test for EPO, so the chances that the B sample result will be different are slim. In the same interview, he said, when he spoke with Jeptoo by phone on Oct. 29, she revealed she thought she had malaria in early September, went to a doctor and received an injection as treatment. Rosa said she had not mentioned malaria or any illness previously—if she had, the protocol would have been to go to an approved Italian doctor in Nairobi for treatment. 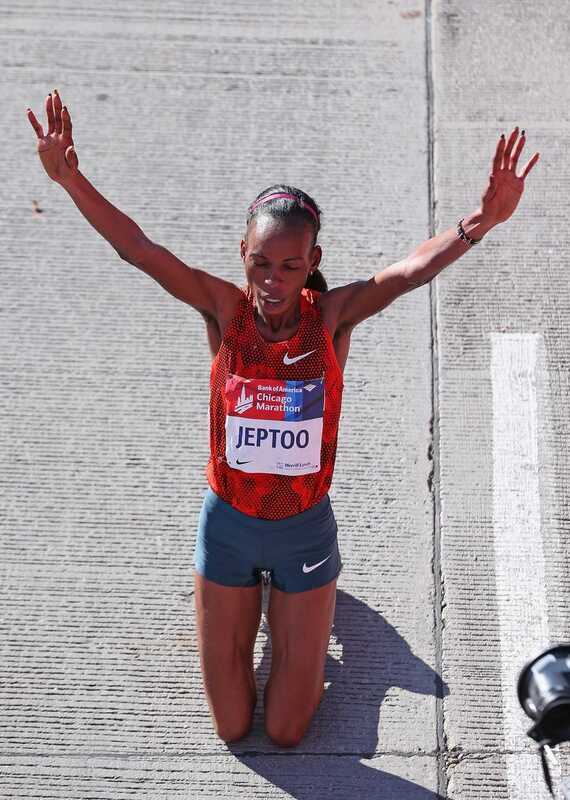 Apparently Jeptoo went to a doctor in Eldoret. Rosa has represented Jeptoo for the past three years. He lives in Italy, but her coach, Berardelli, spends most of his time in Kenya. Rosa, who represents many Kenyan and Ethiopian athletes, has been involved in drug controversies before: Several years ago a Kenyan runner, Mathew Kisorio, tested positive and was banned, though Kisorio admitted Rosa had no knowledge of the abuse. And in 2012, another Rosa client, Jemima Sumgong, who trains with Jeptoo and recently came a close second in the NYC Marathon, failed a drug test, but the ban was rescinded when it was determined that prednisolone had been used locally for a bursitis inflammation. Frederico Rosa estimates he represents between 60 and 70 runners in Kenya alone. Agents make a percent of each athlete's sponsorship contract as well as a percent of their winnings. He stood to make about $90,000 this year from Jeptoo's contract alone. Rosa earns a robust income from the successes of Kenyan athletes. It's hard to know what's going on in Kenya because it's a large, remote country, an ocean removed from the headquarters of WADA and the IAAF. And the distance is not just geographic: Kenya's economy is nowhere close to any in Europe or the US. The average annual income in Kenya is $2,250, and less for women. But sixty-three of the top 100 all-time best marathon performances have been run by Kenyan men, with Ethiopians making up most of the remainder. Kenyan women have a slightly less dominant record, but suffice to say, running is a viable means to a rock star lifestyle there. Combine that with loosely regulated pharmaceuticals and athletes/doctors/husbands/agents/coaches who have everything to gain from a runner placing well in an international race, and very little to lose, and you begin to appreciate the minefield that is Kenyan athletics. We worked together till the end of 2006…. She was used to stay in Italy in my house, and the person I know is a nice girl, with good moral principles and big respect for other people (never she spoke in bad way of somebody else), principles given by her parents in her small village near Moi Bridge. After winning Boston (she prepared in Iten in a camp I created using my personal money, without the intervention of any managements, for helping new athletes and putting together athletes already with me in training before, but living in different villages), her husband decided they were ready for training at home in Mosoriot, and we started to have problems to understand exactly the training situation. For that reason, Rita (with me till 2008, but only more following programs) was no more able to improve (something happening with many Kenyan women, when their husband decide to be their coach, with the presumption to know what they don't know). Claudio [Berardelli] was coaching her from two years now. Before she was doing kind of herself, sometimes with the husband, Noah Busienei, sometimes with some problems. And then before Chicago last year  she had a problem and she asked us to come to Italy to finish the preparations for Chicago when she was second. Then she stayed there 11 months. Being in the group also means she [Jeptoo] sees her son, Shem, only once a month. She stays at the training camp, in Kapsabet, while he lives 30 miles away with one of her sisters in Eldoret. Her husband, a former distance runner, lives 200 miles away in Nairobi. The picture is of a junior high-educated woman, who passed quickly from being somebody's daughter to somebody's wife to somebody's golden goose. Here is a farm girl, accustomed to deferring to male authority, suddenly making hundreds of thousands of dollars a year. Unequipped to manage the company she had become, it might have been easier to just run and let others make decisions about health care, injuries, medicines. The environment is a petri dish for abuse. On the other hand, Jeptoo is hardly a newcomer. In her 15 years as a pro, she must have become very familiar with testing procedures and banned substances, especially one as old school as EPO, that has been tested for since 2000. It's hard to imagine she would blindly accept an injection of any kind, especially if it was not administered by an approved doctor. Of all Kenyan runners, Jeptoo has the least to gain and the most to lose from doping. And of all Kenyan runners to fail a drug test, her case is the least likely to be brushed off, and the most likely to draw intense scrutiny of the entire Kenyan athletic system. The consequences, unintended or not, are that get-rich-quick doping schemes will be squeezed or shut down, and the earning power of all Kenyan runners may be diminished if wary race directors withhold invitations. Greed gone wrong? Wait... does greed ever go right? So many questions, myriad factors; stay tuned.